Theme: Empowering Rural Women – End Hunger & Poverty. While I studied and worked at UC, I began celebrating International Women’s Day through programming campus-wide events like theater performances, film views, dinner and entertainment based on IWD theme for the residential halls, and tabling near the student union. I have to say I LOVE how other countries celebrate it as a day to tell the women in their lives how amazing and loved they are. This is a command (no if, ands, or buts about it)- LOVE the WOMEN in your LIFE. Love all of us in between the female/male woman/man binary, while you’re at it too :). Love esp. to the mamas ;). 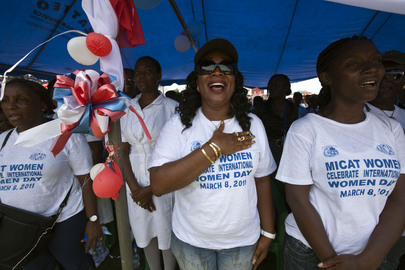 Women sing the national anthem at the celebration of International Women’s Day at Antoinette Tubman Stadium in Monrovia, Liberia, hosted by Liberian President Ellen Johnson-Sirleaf and attended by former Chilean President and UN Women chief Michelle Bachelet. This entry was posted in Uncategorized and tagged International Women's Day 2012 women's health. Bookmark the permalink.